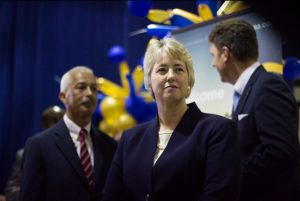 Annise Parker is the mayor of Houston, Texas. She also happens to be gay. And since being elected in 2009 (and then re-elected), she has made Houston the largest U.S. city with a gay mayor. That’s quite the feat in itself—not to mention Texas is a strongly “red” state with a history of being anti-gay. Parker has been advocating for LGBT rights for a long time. She was a founding member of the gay alliance at Rice University, and she and her partner have adopted three children. Parker had stated of Obama that he “needed to evolve” prior to his public support of gay marriage. But her road to victory hasn’t been easy. She’s faced opposition from anti-gay groups who criticize her for being gay. They are “mortally offended that there is a lesbian mayor,” said Parker. She feels that she had to work much harder than she would have if she were straight and running for office.